These are charming, flowering monsters that can no longer be found in the wild. 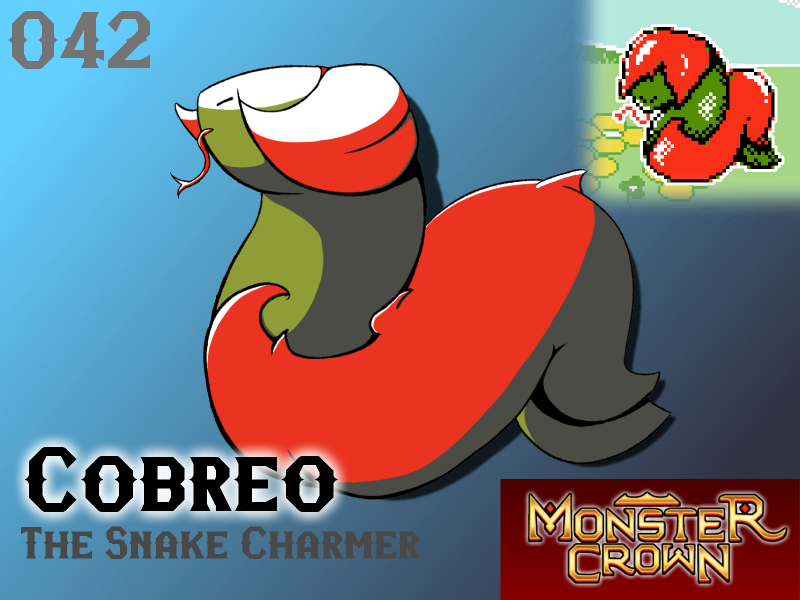 Cobreo are found in large numbers within the Duchess's Garden, a private monster sanctuary found on the west-coast of Crown Island. They constantly emit a sweet, flowery aroma, making nearby Predators unable to track their prey using scent. This same attribute has caused Cobreo to develop an incredible sense of smell, one that was needed to overcome their own ever-present scent. This amazing sense of smell comes in handy - Cobreo's eyes are completely obscured by its own flowering petals. Cobreo are very passionate, experiencing dramatic emotional responses to loss, joy or infatuation. In the event of a natural death due to illness or age, during its final moments Cobreo's flower petals open, and wilt, revealing its eyes for the first time. If a tamer looks into their Cobreo's eyes during these final moments, they are said to be truly overcome with emotion and spend the rest of their days focusing on spending as much time as possible with the ones that they love. Will Cobreo make your team?